A workshop in the grounds of your self-built house can be a boon even to the hobbyist. If you work from home keeping your work separate from the home will be beneficial and will help to keep the home tidy. 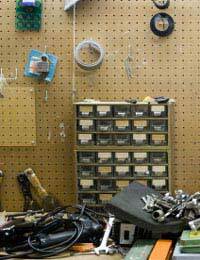 It may be that your workshop can be part of your garage if there is room. Ask your architect to consider this when he draws up plans for the site. Whether you intend to use the workshop for your hobby or for your work you will need adequate power to the building. Calculate how many power points you will need and where in the workshop they would be best suited. Some may need to be at workbench height so that you can plug in lamps and power tools. If you want to use the workshop year round you will need some form of heating. If the workshop is attached to the house you may be able to run your central system into the workshop as well. If not perhaps night storage heaters or a wood burning stove would be better. If your work involves wood it would be ideal to use a wood burning stove to make use of off-cuts of wood. Your house may be sited in the countryside in which case walks in the woods and countryside will mean you can find fallen branches that can be taken back to the workshop to be used for fuel. You may be building your workshop long after your house has been built in which case you may be thinking of purchasing a self assembled wooden building to use as a workshop. Usually shed like buildings do not require planning permission although using them as permanent workshops for a trade may require permission from your local council. When purchasing a wooden workshop you will have to prepare the ground and lay a solid base. Although it is possible to site a shed on a layer of paving slabs as you would a greenhouse if you intend to use the workshop quite often it is best to start with a good solid base. You will need to dig out a base of about a foot in depth before placing rubble in the base and pumping concrete before checking it is level. Wooden buildings will come as a kit and are easy enough to erect. Once assembled consider adding extra insulation to the walls and ceiling to retain heat and make the building more permanent. It is likely that your workshop will have tools that are dangerous to young children. Furthermore your workshop can be a tempting place for petty thieves if it can be seen from the road. Place a strong lock on the door and make sure handles are high enough so that little hands cannot open the door and be tempted to look inside. A fire alarm and a burglar alarm are also a good idea to protect your property and alert you to fire or break-ins. Finally make sure that your workshop and its contents are covered under your home contents and building insurance. If you use the workshop for your job then you may need additional insurance to cover your work tools and machinery. @Gerry. The easiest way to do this is to calculate the cost of the materials for each type of build - then factor in the potential lifetime ofeach, together with any ongoing maintenance that would be required (e.g.wood may need regular treating etc).